Tilapia with avocado is a super simple recipe that highlights the flavors of the fish and avocado. It only takes about 25 minutes, start to finish, and only uses four ingredients (not counting seasonings and salt and pepper). This dish is wonderful served with dilled coleslaw, and the leftovers of both can be used to make fish and slaw sandwiches. A simple green salad would also be a good accompaniment, along with a glass of white wine. Line a 9" x 13" baking dish with parchment paper. Place the fish fillets on the paper. In a small bowl, combine the olive oil, onion powder, garlic powder, and paprika, and mix well with a spoon. Brush this mixture over the fish, coating each fillet completely. Bake the fish for 20 to 25 minutes or until the fish flakes easily with a fork. Insert a fork carefully into the fillet, and twist gently. The flesh should flake easily into pieces without much effort on your part. Meanwhile, combine the avocado, cherry tomatoes, olives, lemon juice, and parsley in a small bowl. Place the fish on a serving platter then spoon the avocado mixture over the fish, and serve immediately. You can find fish fillets that have been skinned and boned at most large supermarkets. Most of these products have been frozen and thawed, even if they are for sale at the butcher counter. There is no loss of quality when fish is frozen, as long as it is frozen properly and not refrozen several times. Ask the butcher or fishmonger how the fish has been handled if you are unsure, and take a sniff before you buy it. Fresh fish should smell of the sea or of nothing at all; it should never smell fishy or rank. 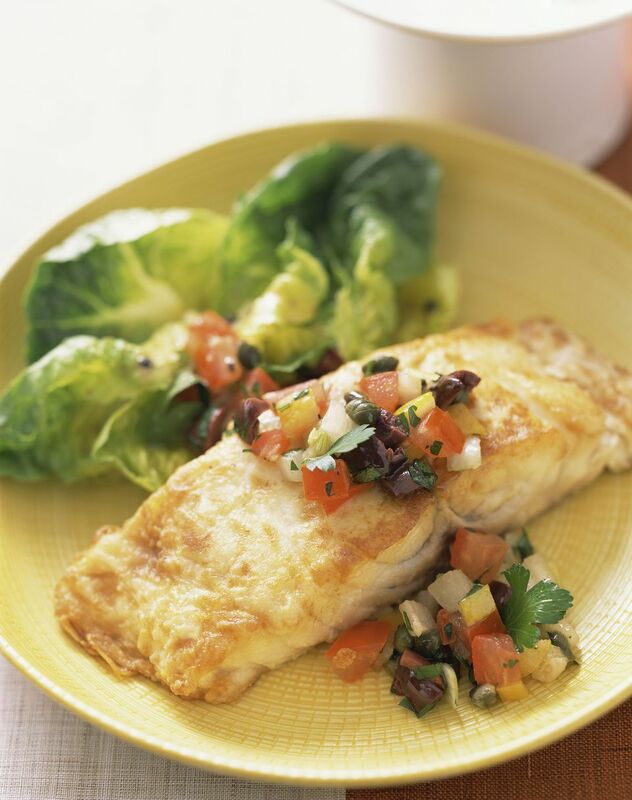 You can use other types of white fish fillets instead of tilapia, if you'd like. Grouper or red snapper or arctic char would all be delicious.